This entry was posted in Autonomous Vehicles and tagged autonomous driving, Blockchains, Connected Cars, toyota, Toyota research institute, TRI on May 23, 2017 by Tim Cosgrove. The Car Connectivity Consortium (CCC) today announced the election of Mahfuzur Rahman, Director of Standards & Technology at Samsung Research America, as its new President. Mahfuzur will oversee the CCC, an organization driving global technologies and standards for car connectivity solutions. He will also chair and serve on the CCC Board alongside representatives from General Motors, Volkswagen, Daimler, RealVNC, HTC, PSA, Honda, LG Electronics, Hyundai, Alpine, Toyota, and Panasonic. Mahfuzur has been an active CCC Participant and Board member since the beginning of 2016. Mahfuzur brings two decades of Consumer Electronics industry experience in connected device services & strategies to this new position. Mahfuzur, in his role as Director of Standards & Technology Enabling at Samsung, is leading R&D and industry consortia activities. Prior to Samsung, Mahfuzur was a Scientist at Panasonic Research in Princeton, New Jersey. Mahfuzur has a vast experience in industry consortia governance due to his involvement on boards of directors or in executive roles in a number of industry consortia including the Digital Living Network Alliance (DLNA), the UPnP Forum, the NFC Forum, and the IMS Global Learning Consortium. He has published over 20 articles at various international conferences, journals, and books and has filed and/or granted over 40 patents. “The CCC, over the years, has become an organization that facilitates the stakeholders of phone-car connectivity ecosystem to develop state-of-the-art connected car features. I am thrilled and excited to lead CCC in this exciting time and be part of the endeavor to drive CCC into new areas,” said Mahfuzur. The Car Connectivity Consortium is currently expanding its portfolio of technologies beyond MirrorLink including two very exciting projects: “Digital Key,” where smartphones are used to gain access to the car, and “Car Data,” which builds an ecosystem for features such as usage-based insurance. These projects are currently in the development phase since approval by the CCC board in June 2016. For further information about CCC projects please use the link http://carconnectivity.org/contact. The CCC is dedicated to cross-industry collaboration in developing global standards and solutions for smartphone and in-vehicle connectivity. The organization’s more than 80 members represent more than 70 percent of the world’s auto market, more than 60 percent of the global smartphone market and a who’s who of aftermarket consumer electronics vendors. For further information, please visit www.carconnectivity.org. This entry was posted in Autonomous Vehicles and tagged Car Connectivity Consortium, CCC, Connected Cars, Mahfuzur Rahman on April 24, 2017 by Tim Cosgrove. In a bid to win the race to develop self-driving cars and give a leg-up to their automakers over their rivals from Silicon Valley, the two EU nations have joined hands to test the cars on a stretch of road linking them. European neighbors Germany and France plan to test self-driving vehicles on a section of road linking the two countries, the transport ministry in Berlin said Wednesday. The route stretches around 70 kilometers (43 miles), from Merzig in Germany’s western Saarland state to Metz in eastern France. It is aimed at testing “automated and connected driving in real cross-border traffic,” the ministry noted. “Manufacturers will be able to test the connectivity of their systems, for example when lanes or speed limits change at the border,” German Transport Minister Alexander Dobrindt said in a statement following a meeting with his French counterpart Alain Vidalies. “We want to set worldwide standards for this key technology through cooperation between Europe’s two biggest car-producing countries,” he added. The route will allow testing of 5G wireless communications between cars and infrastructure, automated maneuvers such as overtaking and braking, and emergency warning and call systems, among others. Germany, home to car giants such as Volkswagen, Daimler and BMW, already boasts a number of test zones for automated vehicles on motorways and in cities, but this is the first that will cross into another country. The transport ministry has offered 100 million euros ($107 million) in funding for the projects. The tests come as the nation’s traditional carmakers are racing to catch up to Silicon Valley newcomers such as Tesla, Uber and Google parent company Alphabet in the new field, seen as the future of driving. Automated trucks in particular are expected to shake up the road transport sector in the years to come. In a glimpse of what lies ahead, manufacturers took part in an experiment last year that saw six convoys of “smart” trucks cross several European countries using “platooning,” in which a leading truck sets the route and speed for wirelessly-connected self-driving followers. 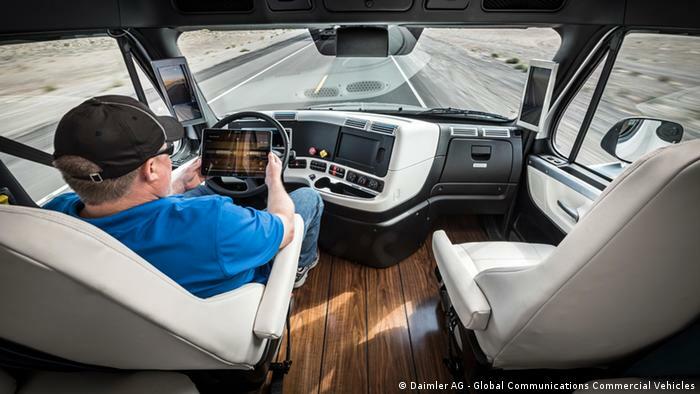 This entry was posted in Autonomous Vehicles and tagged 5G wireless communications, Alexander Dobrindt, autonomous cars, autonomous driving, Connected Cars, connected driving, self driving cars on February 10, 2017 by Tim Cosgrove.